I know, another long post title. I can't break free! On a more serious note, I have had such a good time getting to know you all through yesterdays' post. My, you all are a fun and talented (check out this and this and this and this!) group of people. Thanks for taking the time to let me get to know you. I feel so much better now. So, I'm still sugar-free. The end of my fast (Easter) is fast approaching and I think that is actually making things a little tougher. Now when I get a craving, knowing that in a week or so I'll be able to act on that craving seems to make it more intense. I'm still planning on having sugar on Easter as a way to celebrate, but I'm not sure it's the best way to celebrate 40+ days of no sugar. Celebrate no sugar with sugar. It doesn't make sense. But, that's the plan and I (obviously) have not rid myself of the idea of rewarding myself with food. One thing at a time, people. I've started reading Sugar Blues by William Duffy. I'm telling myself it's required reading and I think it will help me get back on the sugar-free wagon after Easter. I will be giving sugar up again after Easter and am going to choose a handful of very specific occasions (Friday night is NOT a special occasion) throughout the year when I will allow myself some processed sugar. In the meantime, I am identifying resources that will teach me how to use natural sweeteners like honey, stevia (which we are growing this year), pure maple syrup, etc. I'm collecting recipes, folks! If you have a recipe that only uses natural sugars that you love, please share it with me by either leaving the recipe in a comment or by linking to your blog if you've posted about it. Thanks! About two weeks ago, I started allowing myself honey mainly because I was struggling with what to eat for breakfast. Oatmeal rolls with butter was really good for awhile, but I needed some variety. I decided to make granola (my Grandma's granola). I eat it with cold milk poured over top. It's delicious. The closest thing to cereal I've had in a long time. This granola is my new best friend. I look forward to breakfast again each morning which is important since I need the fuel after a night of sleep and nursing a teething baby girl. And, it's not just for breakfast. I'm eating a bowl as I write this. Yes, I am. It's important to immerse yourself in your work, right? Although this does not feel like work. Much more like play. Place all dry ingredients, except the dried fruit, into a large bowl and combine. Measure and add the canola oil. Do the same with the honey in the same measuring cup. The oil will help release the honey so none is wasted. Add the vanilla and combine everything well, breaking apart really large chunks into smaller ones. I started out by greasing two large baking sheets really well and then spread the granola evenly on them. No matter how much I greased (I tried this several times), the granola still stuck to the baking sheets making it a bear to get off (it wasn't burnt- just stuck on real good). What I've found works MUCH better is to line the baking sheets with parchment paper. The granola doesn't stick and you can lift the paper up and pour the granola right into your containers. I shake off the crumbs and reuse the parchment paper over and over. Bake granola at 300 degrees for about 20 minutes, stirring/turning it once halfway through, or until it has browned to your liking. We like ours medium brown around the edges and slightly browned in the middle. 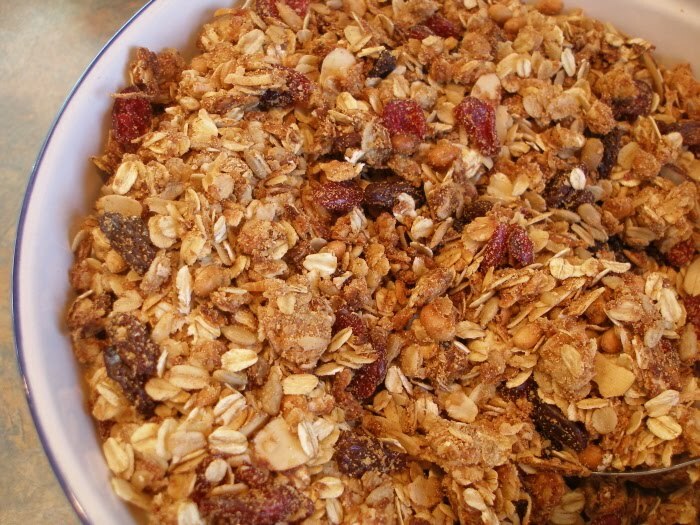 After the granola comes out of the oven, I sprinkle it (while it's still on the trays) with the dried fruit. Fruit that has been baked with the granola is too chewy for my taste. This keeps the fruit soft. Toss the fruit into the granola. Let cool completely and store. We store ours in two two-quart jars. This recipe makes an even gallon of granola. Our gallon disappears in about 4 days. the granola looks super yummy. 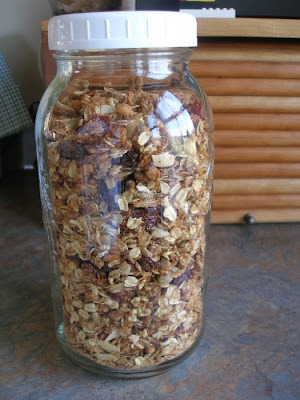 i've never made any sort of granola before but i definitely LOVE it (especially in yogurt)! any particular reason you use soy flour? i don't have any and was wondering if "regular" flour would make a big difference? You can avoid greasing the pan AND using parchment paper. Just stir the mixture every 3-4 minutes once it is in the oven. More importantly, do not let it cool completely in the pan, that's when it becomes a brick. Christy, I think the soy flour is included for nutritional value. I've just run out, so will be making it next time without. I'll come back and let you know if it needs a substitute or not:-). The granola looks great. I mess with my measurements all the time depending on how sweet I want it. The honey is what makes it stick, so you might cut back just a tad and see how you like it. Tell us if the honey book has recipes for canning with honey instead of sugar. I tried some last year with varying results. Wow...I am compltely impressed...no sugar?! You are good. And I have to say...the granola looks amazing. I am definitely going to try your recipe...it can't be bad if it's from your grandma! I am sorry if this is a double-comment, but wanted to be sure that I tell you about this resource that I was just given. It's a cookbook that uses natural sweeteners. It is actually a vegan cookbook, but it would be easy to modify the recipes to add in eggs, milk and meat, whereas it's difficult to modify recipes to remove those things. In any case, it's called Clean Food. I'll include the Amazon link so you can see more about it. I'd encourage you to check it out, especially because it's a great resource about how food is meant to be consumed. Your library may have it if you want to read it before committing to own it. Hope it helps! I think you will enjoy cooking with honey, we try to use it as a replacement for sugar in as many recipes as possible. Stevia on the other hand was a little more difficult for us to use because of the flavor but we loved using it in tea. We might try growing it again this year if the seeds I tried to save germinate...they looked a bit iffy. I will have to check with the family baker for some recipe ideas for you. Well, I just made a double batch (yes, two gallons of granola- just for us) using whole wheat flour instead of soy flour and the difference was negligent (it's still yummy). I will update the recipe above. David, I still used my recycled parchment paper, but I emptied my cookie sheets right away and this did cut way down on the sticking- thanks! This sounds really good. I am trying to use more honey which is good for allergies int he area. This is the recipe that I'll try when my fast is offer. Looks yummy!